Dhaka, Feb 9 (Just News): BNP leaders and activists brought out a procession from Purana Paltan area in the city on Saturday in protest against the imprisonment of their Chairperson Begum Khaleda Zia in a graft case. The BNP men brought out the procession from opposite to Kakrail Mosque area around 1:20 pm chanting slogans for the release of their leader. When they reached Fakirapool water tank area police chased the protesters around 1:30 pm and dispersed them. They also arrested several leaders and activists from the area. The BNP men brought out the rally as part of their 2-day protest programme against Khaleda Zia's conviction. Earlier on Friday, they staged demonstrations across the country protesting Khaleda Zia's imprisonment and demanding her release. 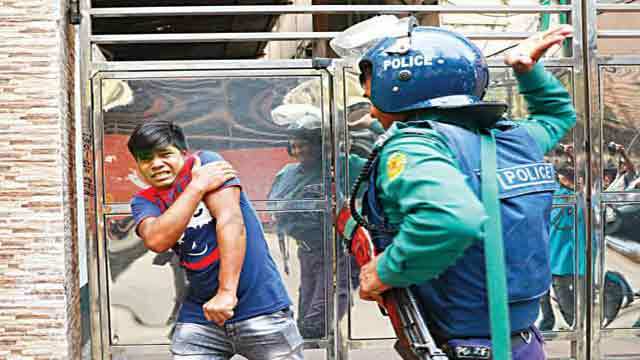 On Thursday, a Special Court here convicted former prime minister and BNP chairperson Khaleda Zia and sentenced her to five years' imprisonment in the much-talked-about Zia Orphanage Trust graft case.